Let's say you're embroiled in an all-out mega-grill arms race against your dastardly neighbor. What's a car guy to do? 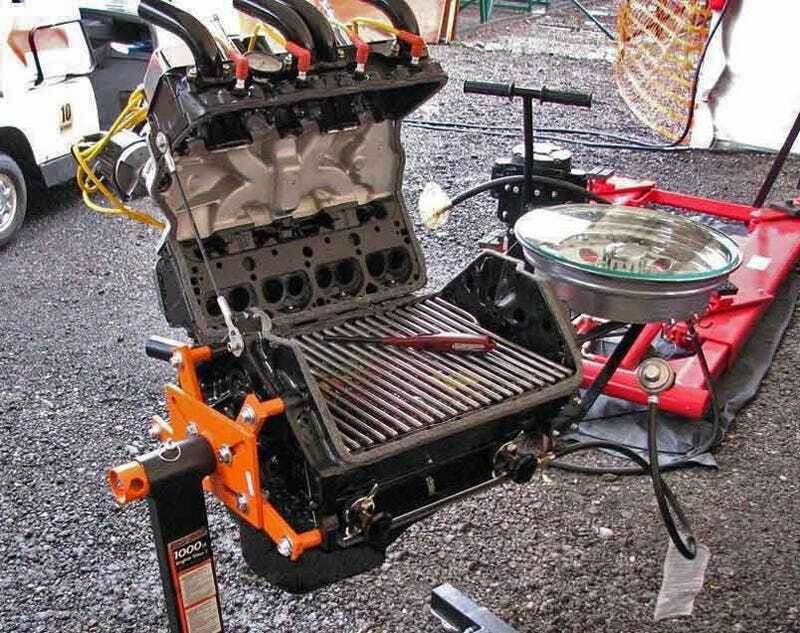 Create an incredibly unique grilling masterpiece from the leftovers of a small block Chevy engine. My neighbor Terry Bacon had all the torches and welders so he played a big role in that department. The idea has been rolling around in my head for a couple years but I just hadn't found the time or all the parts to pull it off. I did some internet searching to see if anyone had already built one and that is how I found your site. There are some cars that have been turned into BBQ's and some BBQ's that are ran by an engine but I have yet to see an engine that has been made into a BBQ. It's been an interesting turn of events in the making. When I pitched the idea to some of my friends, most thought I was a little off but after they saw it in working order they were impressed. It is still a work in progress with lots of add-ons to come. Now that it has proved to be a functional unit it's time to dress her up a bit. I took it to a local car show this weekend and I think my grill had more lookers than a lot of the cars there. It was definitely the hit of the 4th of July BBQ.